Thomas Friedman, the New York Times columnist as recently as two weeks ago, credited about a dozen people including George H W Bush, his cabinet members, Margaret Thatcher, Pope John Paul II, German Chancellor Helmut Kohl, the French President Mitterrand, and even Mikhail Gorabachov with helping in the disintegration of Soviet Union. One name that was conspicuously missing was that of Ronald Reagan, who was at the heart of the political game that resulted in the break up of the Soviet Empire! Liberals just cannot bring themselves to thank Reagan for his bold steps that helped defeat Communism around the world. In eight years of his Presidency, the liberals could only badger him about the growing deficits. Though the rising tide of economic growth had lifted ordinary Americans higher, 'the gloom and doom sayers', never accepted the general affluence of the people as real. Reagan had left office in 1989, leaving the American people vastly better than when he took office. Reagan believed that the Congress, controlled by the democrats in those days did not exercise fiscal responsibilities and helped in growing the deficits. He also believed that with the right economic policies, with low taxes and low interest rates, it was possible to grow out of the deficits (this was true after a few years, in the nineties). The Iran Contra affair was the only blemish on his Presidency that fades in comparison to his achievements. Democrats and their accomplices in the press had tried to make political hay out of it. Reagan was adamant in his claim that he was unaware of some of the illegal activities that was going on without his knowledge. Americans believed him. In one of his very last speeches in 1994, Reagan said, 'However, our task is far from over. Our friends in the other party will never forgive us for our success, and are doing everything in their power to rewrite history. Listening to the liberals, you'd think that the 1980's were the worst period since the Great Depression, filled with suffering and despair. I don't know about you, but I'm getting awfully tired of the whining voices from the White House these days. They're claiming there was a decade of greed and neglect, but you and I know better than that. We were there." The legacy of Reagan continues even today. There is no discussion of economy without mentioning the beneficial effects Reaganomics. 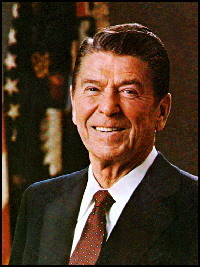 Reagan also had brought the Welfare issue to the forefront, which dominated early nineties debate resulting in comprehensive reform of the system.